Along with this particular revised picture, Crest Nicholson have also provided updates for most of the pictures in the photo montage that follows. One feature of the Crest Nicholson pictures is that they have only provided the finer details for those buildings in Phase 1, on the basis that they haven't chosen an architect for the later phases yet and it would be premature to provide details for something that has not yet been designed. While this has the advantage of identifying exactly which buildings are in Phase 1, it has the disadvantage that without windows the buildings look more like a set of nuclear reactor buildings than dwellings. So where this masks the impression of what the building might really look like, we will have to include our own "illustrative only" details, adding windows of a similar style as those in Phase 1. Another feature of the Crest Nicholson pictures is that the underlying real photographs were taken on overcast, hazy days, so some of the detail in the distance is obscured. Where we believe that matters, we have retained Patrick's sunny day background pictures. For clarity, in each case we have identified whose pictures are used. But first of all, let us go back to the model that was shown in Green Park, which showed the expected trickery: tricks like trees considerable taller than they are in nature to make the buildings appear smaller or to mask the appearance, and the use of transparent materials for the model blocks, also to create the optical illusion of smaller buildings. Look at the effect if the transparency is removed and the buildings are coloured on a photograph of that model (we have kept the trees!). After the height of some of the buildings was reduced, we built our own scale model to see what the impact would be. 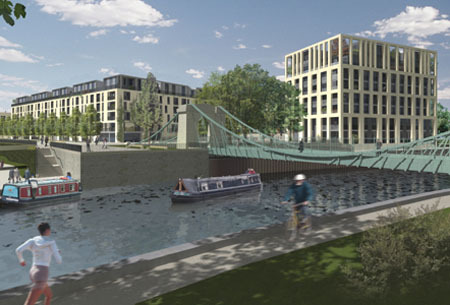 Our model was of the whole strategy for the Western Riverside, as described by the Urban Regeneration Panel. 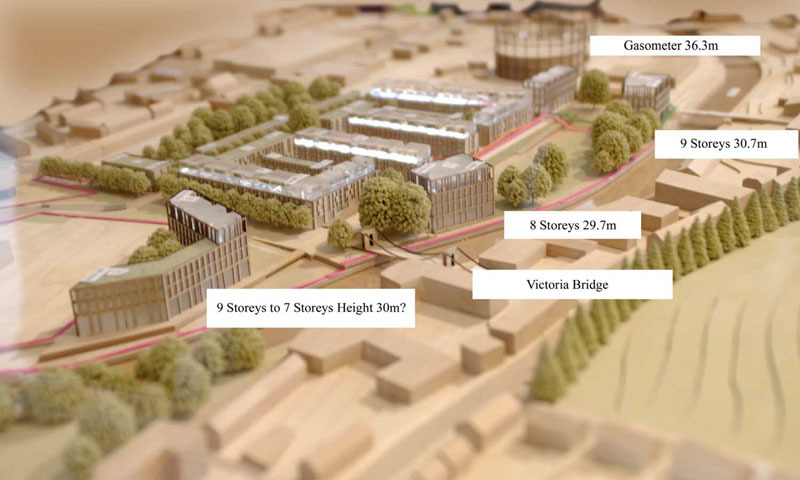 Their ideas for the Green Park Station area are the buildings nearer the camera than the blue lines and to the left of the river. 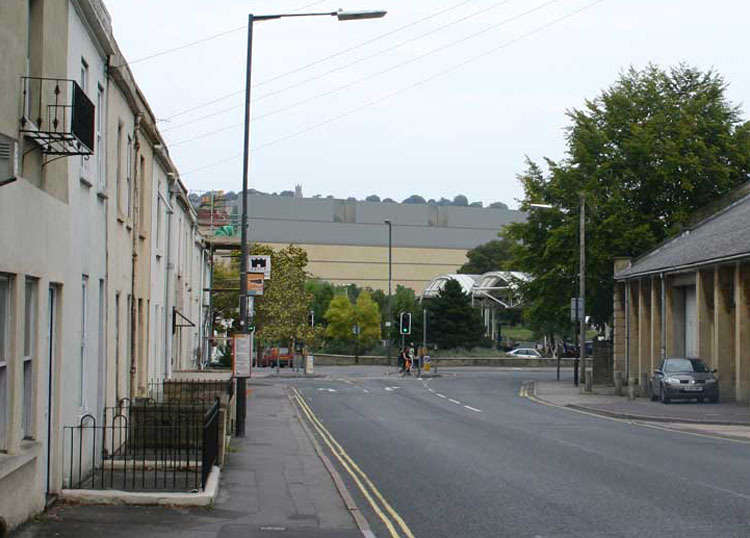 To the right of the river are the existing buildings: Norfolk Buildings, Norfolk Crescent etc. 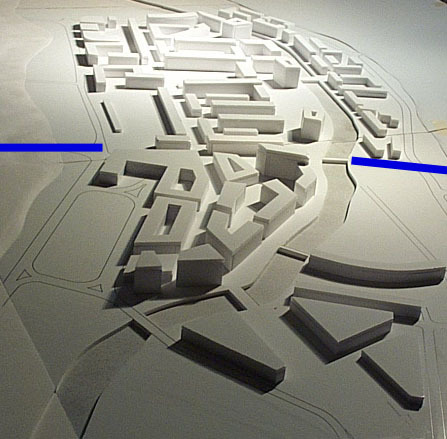 Crest Nicholson's site is beyond the blue lines and left of the river. To the right of the river are the current buildings: Onega Terrace, Comfortable Place, Albion Buildings etc. Everything is to scale, both in height and location. 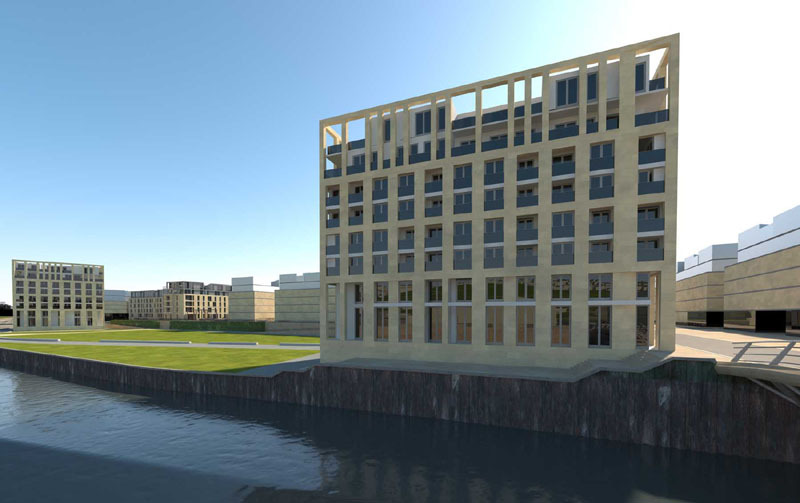 This view of the model directly compares the vertical scale of the Crest Nicholson development (left of the river) with the buildings, several of which are listed, on the right of the picture. Everything is to scale, both in height and location. Crest Nicholson have provided their own views from Brougham Hayes. 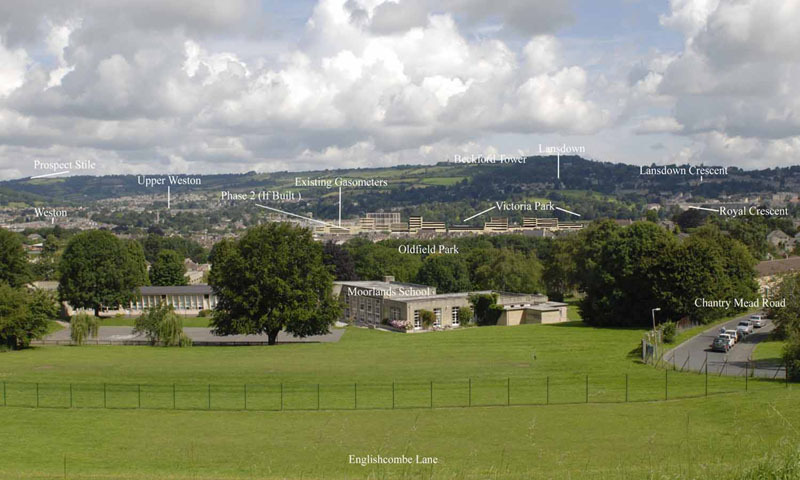 This is the view as you see it today, with Victoria Buildings on the opposite side of the Lower Bristol Road, and views of Lansdown, looking towards the Royal School, through the open space to the right of Victoria Bridge Road. Below is Crest Nicholson's picture, not quite from the same viewpoint (perhaps the van got in the way of the picture from exactly the same spot). 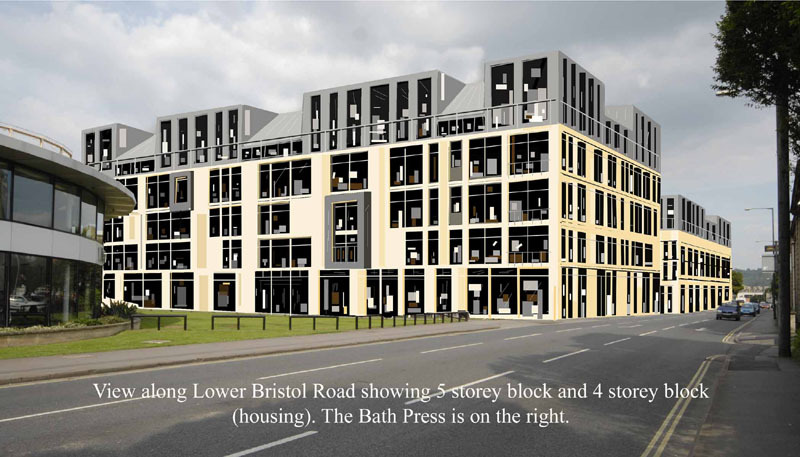 Their building that blocks the views towards Lansdown is shown with no windows, because it is not part of the first phase planning application and Crest Nicholson say that they can't predict the detailing when they haven't chosen an architect for the later phases. But when built it will have windows, and we can't imagine later phases departing far from what is built for the first phase, or else the first phase designs will look badly out of place. 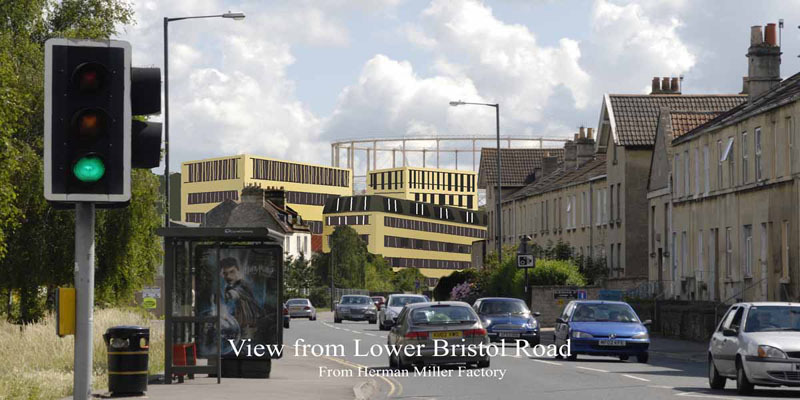 This second picture (below) was taken from the other side of Brougham Hayes and shows that same building in the background, blocking the Lansdown views, but from this angle you can see how wide it is, as well as how tall. That set of Brougham Hayes pictures show just the details of what is in Crest Nicholson's planning applications. 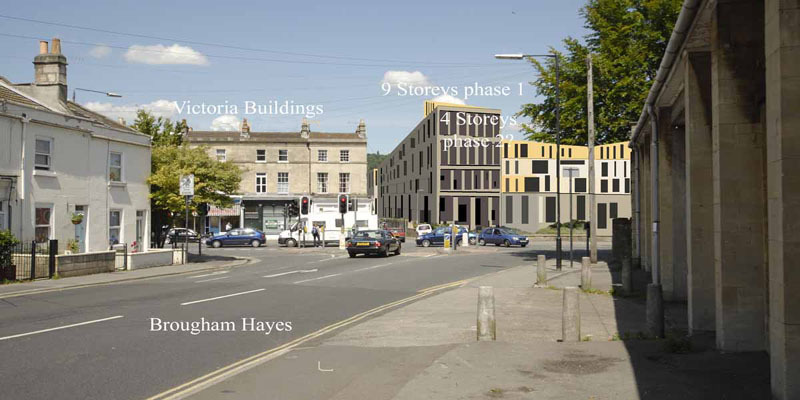 However, the council has a spatial strategy which includes buildings on the Homebase and Sainsbury's locations. For completeness, we have to show you (below) the effect of those ideas. But you can't blame Crest Nicholson for the building in the foreground. Blame the Urban Regeneration Panel instead. 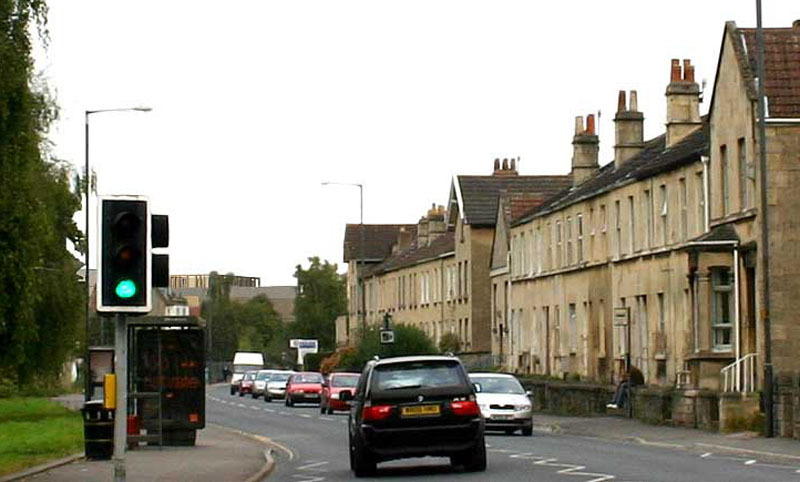 It is a similar scenario looking along the Lower Bristol road. Notice how the scale of the "normal" building partly hidden by the bus shelter is dwarfed by the block alongside and the even taller block behind, and how the cubic shapes look even more stark when viewed behind the slopes of tiled roofs. The picture below is our montage. Crest Nicholson provided us with what they described as an equivalent photograph. However, if you examine the picture below, it was taken from further back with a wider angle lens (look at the view just over the bus shelter to demonstrate this), which minimises the scale of the buildings on the Western Riverside. 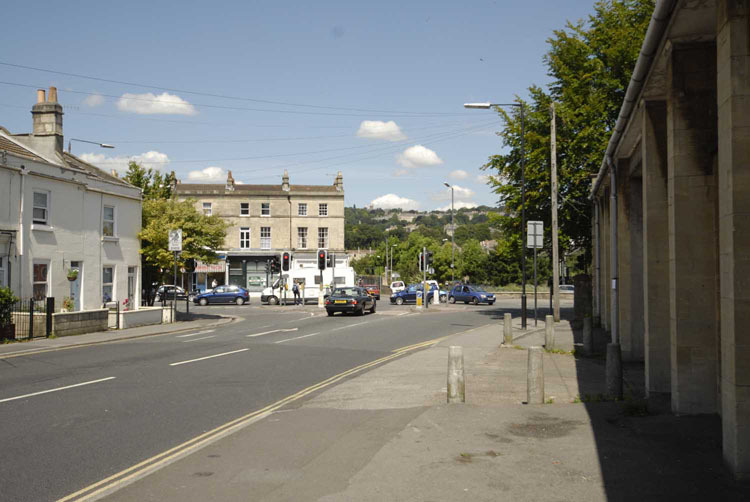 If approaching from the other direction along the Lower Bristol Road, the appearance is even more stark. These blocks loom above pedestrians like cliffs! 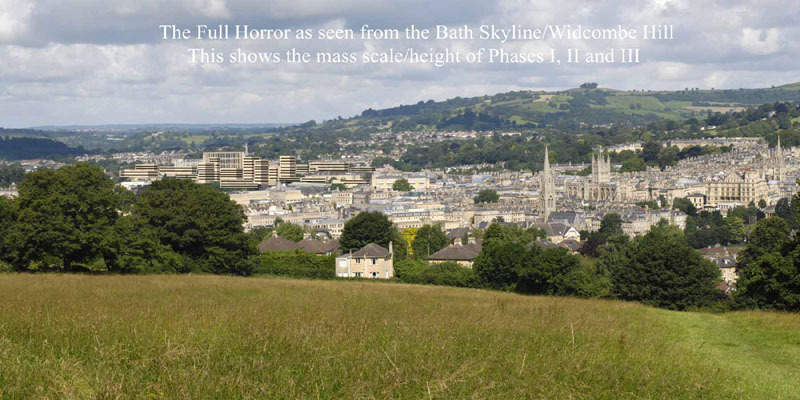 They are too tall, too cubic in shape and too fussy in appearance to ever blend in with Bath's traditional classical style. Crest Nicholson did not provide us with an equivalent to this picture. Even worse are these buildings towering over pedestrians as they approach the Grade II listed Victoria Bridge. The picture below needs no further comment from me. This picture was provided by Crest Nicholson, and in the pictures they supplied us, they used the convention of including windows only in the buildings that form Phase 1, claiming that the exterior appearance of the later phases was still to be determined. There are two fundamental arguments against this reservation by Crest Nicholson. 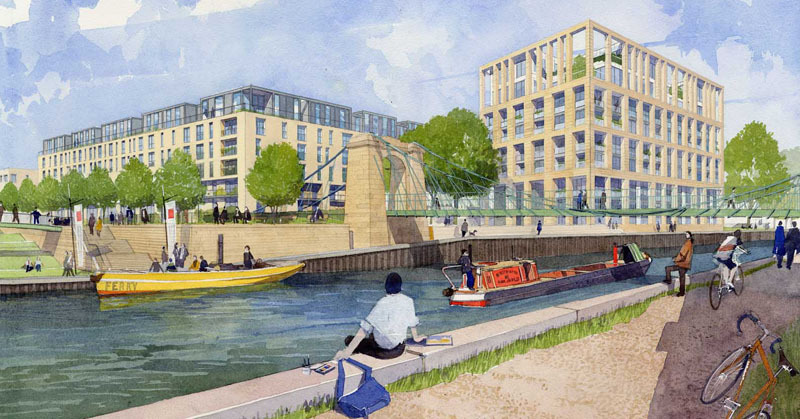 The first is that the Supplementary Planning Document for the Western Riverside requires the who site to be designed in a compatible style, so what was proposed for Phase 1 sets the model for the remaining phases. 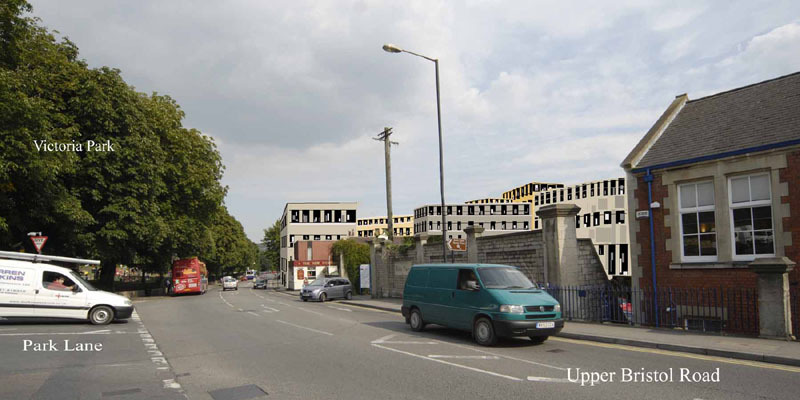 The second is that a number of "artist's impressions" have been used in publicity material, and these do show a similar style for the later buildings, as seen below. The view from the Destructor Bridge is no better. (Notice too that the destructor bridge has been replaced by a modern bridge, which just shows on the right of the picture). This picture has been supplied by Crest Nicholson, and again they only show window details for the Phase 1 buildings. And once over the bridge, the view from the Upper Bristol Road is just as bad. Crest Nicholson did provide an equivalent picture, but theirs did not include the buildings that would be erected on the site of the refuse depot and recycling plant. 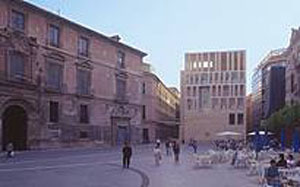 The buildings here are described as Phase 4, but nevertheless they are included in the masterplan and should be shown on a photo montage of the completed scheme. So we have retained our picture. 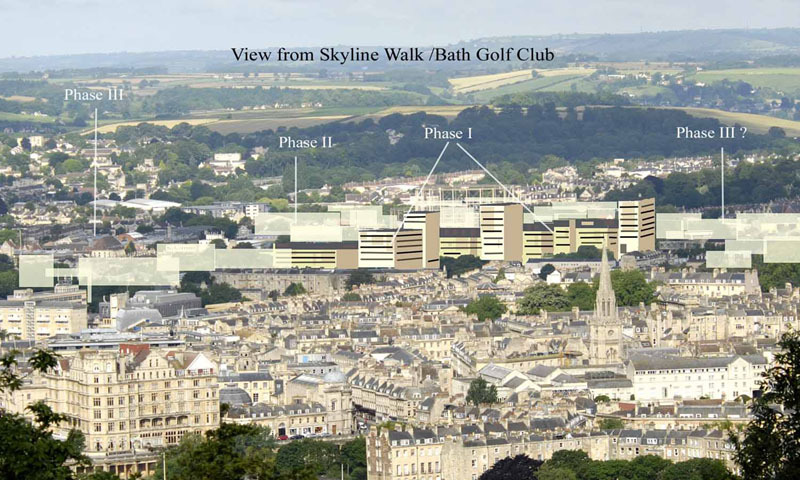 But let us not forget that Western Riverside is intended to be built in three phases, and that visitors come to Bath to enjoy and photograph the architecture. 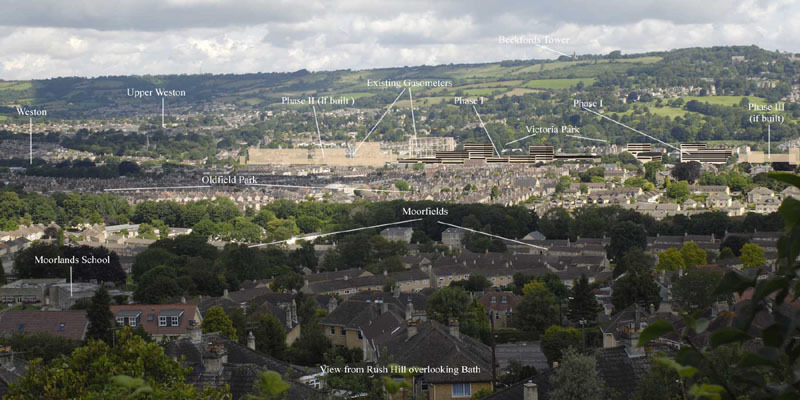 So in the pictures that follow, we take our imaginary tourist round the Bath Skyline Walk (or perhaps have the open-topped tourist bus stops at convenient viewpoints). 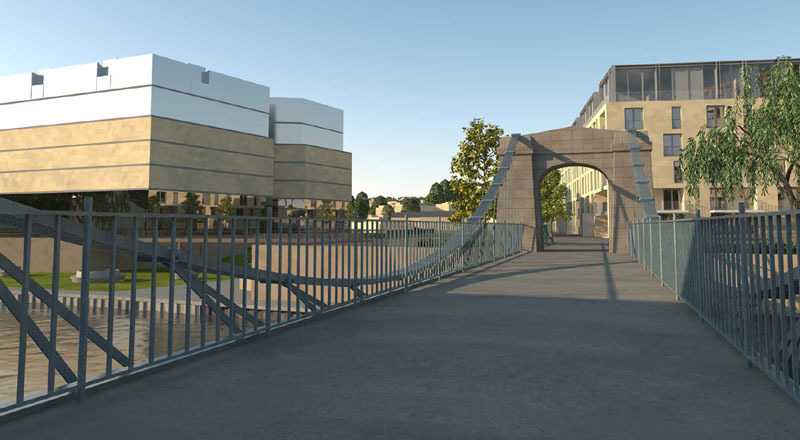 We based the picture below on the view from North Road where the sight line looks along the Western Riverside site. The underlying photograph was taken on a sunny day. Crest Nicholson's equivalent picture was taken on a misty overcast day, from a lower viewpoint and with a different focal length lens, all of which make the new buildings appear less prominent that they would be in better weather, so we have retained our original picture. The picture above was the Skyline Walk view of North Road. 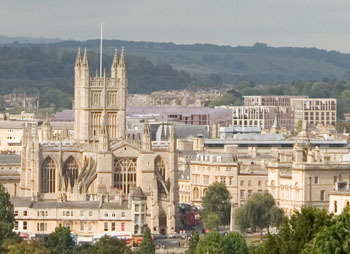 However, the tour buses have another view of North Road, where there is a lovely view of Bath Abbey. Look below and see what will greet the tourists when they try to take that photograph after Western Riverside Phase 3 is complete. Not what they will expect of a World Heritage Site, is it! Crest Nicholson did provide what they claimed was an equivalent picture, but it was not taken from the same place! 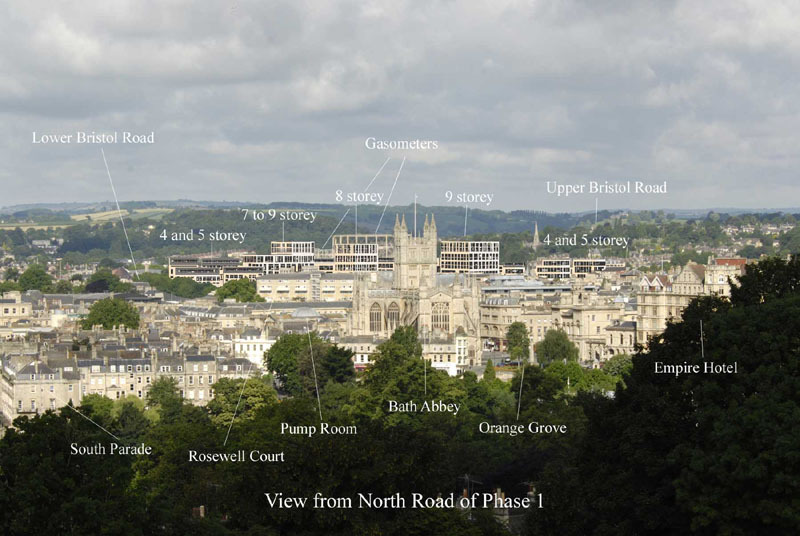 Examine our picture above and note how the flagpole on Bath Abbey coincides with the hilltop on the skyline. On the right, I have taken (and magnified) the section from the Crest Nicholson picture that shows Abbey flagpole and hilltop, but notice how the hilltop is significantly to the right of the flagpole. That photograph was taken a considerable way south of the viewpoint from which our picture was taken and thus higher up the hill, which of course changes the relative position of the Western Riverside development with respect to the Abbey, and the apparent height. Now imagine construction starting on Phase II (below). With just the shell and scaffolding, there is not much detail yet, but the view below from the Skyline Walk at Rush Hill is not pretty. Step forward in time and Phase II is complete. So back to the Skyline Walk and below is the view from Englishcombe Lane. Notice how the heritage locations are insignificant compared with the Western Riverside. But unfortunately, not all of the Skyline Walk is so far away. From the Bath Golf Club it dwarfs the views of Bath in the foreground. 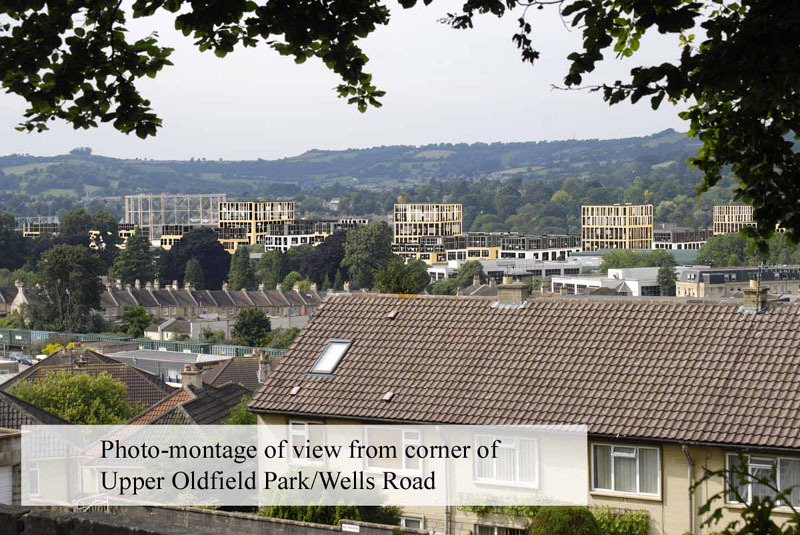 Now look at the view from Widcombe Hill (below), when Crest Nicholson have left Bath with its complete scheme to mar the views for years to come. Again Crest Nicholson provided us with an "equivalent" taken on a murky day and from a different viewpoint, so that the impact of the Western Riverside is reduced. Their picture was taken from further to the right and lower down the hill, and with a narrower angle lens. Now picture yourself in a bus or coach travelling down Wells Road. Below is the view you would get at the Upper Oldfield Park junction. 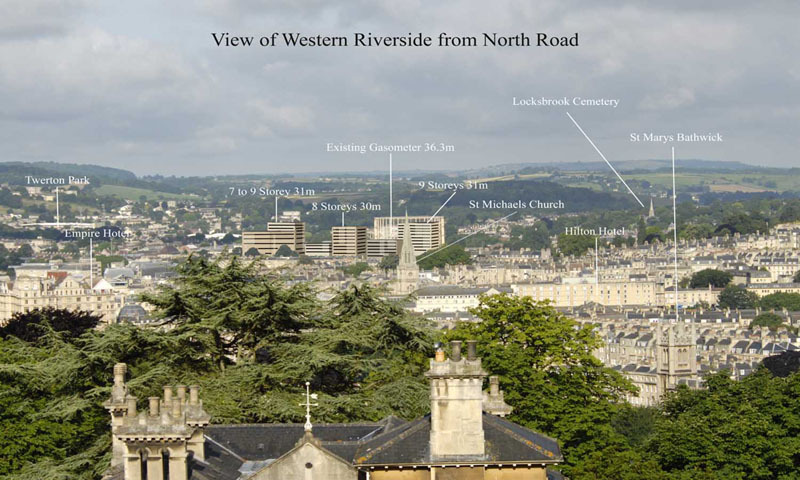 Remember how the Crest Nicholson publicity leaflets promoted the Western Riverside as being specially designed to "complement Bath's Georgian architectural landmarks"? 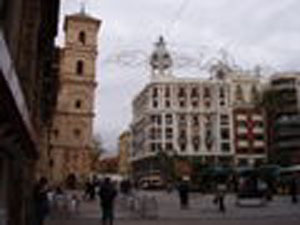 Yet look at these pictures, of locations within Murcia in Spain (the left one is Plaza Cordinal Belluga, the right one is Plaza de Santo Domingo). Doesn't the style look familiar? Specially designed for Bath looks a bit suspect! Now look at an example in England. There is now an on-line petition on the Downing Street website asking the Prime Minister to halt the development in its current form. If you don't like what you see above, please add your signature (but do so only once! ).